You’ve probably heard of people proposing at sporting events using the Jumbotrons, but this is ridiculous. To help document the excitement surrounding the June 2006 grand opening of the 5th Avenue store in New York City, Apple setup a special time lapse webcam to capture the first 24 hours. The store opened at 6pm. By midnight, the crowds were starting to die down. By 1am the crowd control barriers were removed. By 3am the crowds had vanished. But if you keep watching the time lapse video (shown below), sometime after 5am, an unknown man stands in front of the webcam with 3 giant pieces of paper. The first piece of paper just has a name: Uschi Lang. The second piece got a little more personal: I love you. And the third piece got to the point. It said: Will you marry me? Obviously someone had decided to take advantage of the webcam and use it to do a time lapse wedding proposal. So after watching this video, your first question will probably be “Did she say yes?” According to Jason Kottke from kottke.org, Uschi Lang did indeed say yes. Apparently Uschi and her fiancé, James (that’s his name by the way), were both in line earlier that night for the Apple Store grand opening. While in line, James noticed the camera and got the webcam proposal idea. While Uschi was sound asleep, James snuck out of bed around 4:30 am, grabbed some giant pieces of paper and went back to the Apple Store. He then held up his 3 signs for 5 minutes each to make sure that they were captured on video. Those were probably some of the longest minutes in his life. If you watch the video carefully, you can see several people staring at him like he’s nuts. And there you have it. 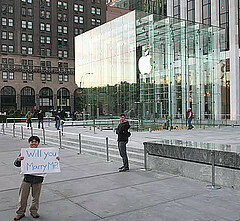 The full story behind the Apple Store webcam wedding proposal. Was it nerdy? Yes, but it was also timeless, opportunistic and creative. Let’s just hope that James and Uschi have a long and happy marriage. Not everyone gets their wedding proposal forever preserved in a time lapse video on Apple.com. Not to mention that it was immortalized online by thousands of bloggers (including this one). Good luck James and Uschi.